Deadly demon skull throwing knives are aerodynamically on point. With piercing drop point tips, each perfectly balanced knife is solidly built of Stainless Steel. 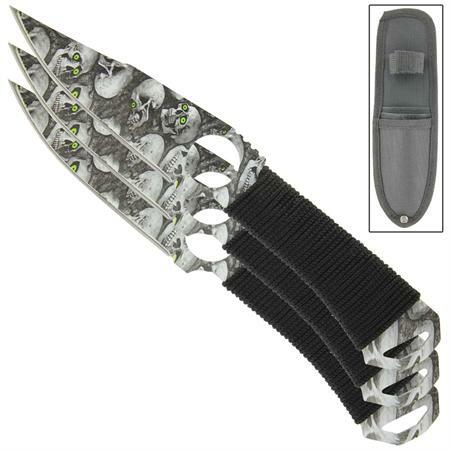 Shipping factory sharp, the 4 inch blades have a stylish skull skin finish for a unique look as well as to prolong the life of the blade. To add comfort the handle is wrapped with a black nylon cord for a more comfortable grip. Included is a FREE 3 compartment nylon sheath. Overall Length: 8 Inches.